But why all this ? How SvxLink manages it all ? Normal or reverse SQUELCH detection selectable by jumper. Protection by opto isolated on digital Input and Output. External Watchdog with ajustable timer set by solder jumpers. Isolated Audio interfaces with adjustable level for 3 way. The temperature sensor mesures the repeater cabinet, it could very well activate a thermal resistance to maintain the cavities at good temperature. And transmitting with voice the temperature. Possibility to change output repeater power in low power with switching relay. Possibility to switch off power supply to switch in battery mode. Analog input can mesure smeter but also for measuring the supply voltage or the battery voltage, a relay may then cutting battery power to preserve them. This will connect a LCD / GLCD screen, buttons on the I2C port, a real human/machine interface that will display the repeater states or events. Inputs digitals can indicate the 230V power supply or the door of the cabinet status. Repeater send by mail every evening a reporting of activity. A web page show measurement and status of inputs/outputs in realtime. You'll understand the possibilities are great and belong to your imagination. It's very simple, it handles only the PTT and squelch detection switching and audio mixing. 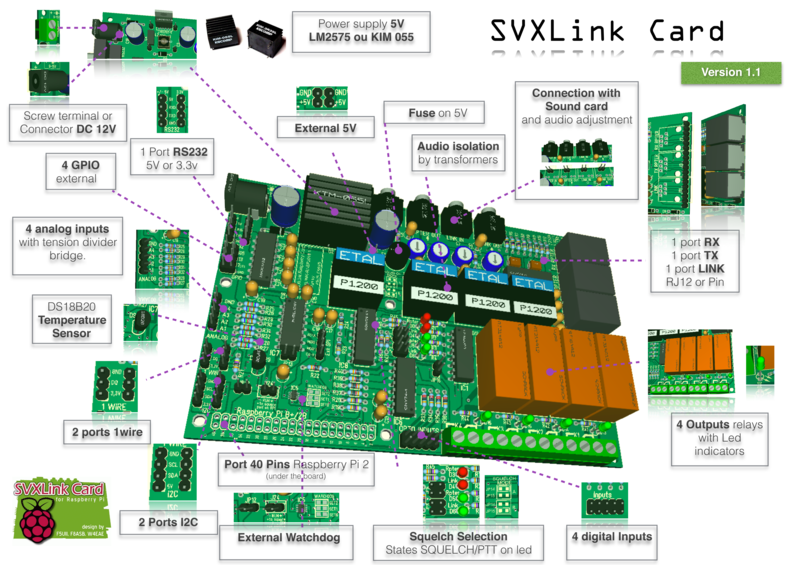 It also manages direct radio link or through echolink and voice synthesis. For everything else it's us or you to code. The Linux world will allow all that, for example, repeater display will manage with a small program that will read the LOG file of SVXLink and display it on the screen. All state variables or measures can be shared between applications. CRON can enable to schedule scenarios at time, for example sending repeater information an email every day at fixed time of the day.